The national rugby war memorial? It was recently announced by Clare Campion-Smith, the Lord Mayor of Bristol, that the city’s Ceremony of Remembrance in 2016 will be held at the Memorial Stadium. Usually the service and parade is held at the Cenotaph in the city centre, but this area is being remodelled for Metrobus. The directors of Bristol Rovers FC, who own the Memorial Ground, have kindly offered to host the event. This is a great and fitting honour. Next year will be the hundredth anniversary of the Battle of the Somme, which did for so many soldier sportsmen. The Memorial Ground was given in trust to the Bristol Football Club (RFU) as a memorial to the 300 Bristolian rugby players who had lost their lives in the First World War. It was intended to be a dynamic, living and lasting tribute. Annual services of remembrance have been held at the war memorial sports ground ever since 1921, usually on Armistice Day. In 1945, the Ground was rededicated and the memorial tribute was extended to the rugby dead of the second world war. The rugby memorial ceremony is usually held at the entrance gates to the Memorial Ground, on the eleventh day of the eleventh month, at the eleventh hour. It is attended by the directors and playing squads of both Bristol Rugby Club and Bristol Rovers Football Club, former Bristol players, Bristol Combination club representatives, supporters clubs and local residents. Local clergy conduct the service and a trumpeter sounds the last post. Wreaths are laid and a silence is observed. The Memorial Ground is dedicated to rugby and every day is day of remembrance. Could this historic, poignant and distinctive war memorial sport ground become the national rugby war memorial? 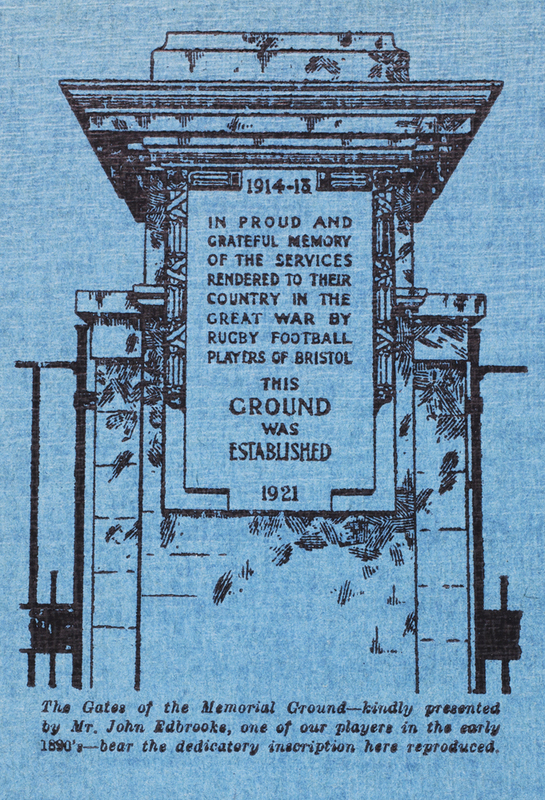 The President of Bristol Rugby Former Players, has stated that “The memorial is not only for those who wore the famous blue and white jersey, but for all rugby players who died for their country.” Britain lacks a national rugby war memorial. In the centenary years of the First World War, this could be put right. Lest we forget. This entry was posted in Uncategorized on November 10, 2015 by jamiecarstairs. The Memorial Stadium has been declared an Asset of Community Value (ACV) by Bristol City Council. ACV status means that if the Memorial Stadium comes up for sale, a group of residents, or a group of Bristol Rovers FC fans, or another group with a sympathetic plan, would have a brief opportunity to purchase the site, and to ensure that sport can carry on being played there. The ACV application was submitted by The Bishopston Society, thanks to the Localism Act (2011) – see www.bishopstonsociety.org.uk. Research by the New Economics Foundation (Stephen Spratt) has shown just how important football clubs – and their stadiums – are to their local community. The stadium itself is the place that holds the memories of the fans and the team, often over many years. It becomes a home from home, a place which fosters and is integral to community cohesion, identity and confidence. Eric Pickles who as former Secretary of State for Communities and Local Government introduced the Localism Act, has expressed this sentiment well: “Football stadiums are not only the heart and soul of every team, they are rooted in and loved by the neighbourhoods that surround them.” The Memorial Stadium is just such a stadium. Preserving and enhancing such well-established community assets, helps to strengthen and sustain strong communities. The Memorial Stadium (or Memorial Ground) has long been a very special local and city asset, inspiring the city’s youth to take up sport and to lead healthy lives for almost a century. The Memorial Stadium is used by Bristol Rovers FC, one of Bristol’s two professional football clubs, and is a venue for League level football matches. Spectator sport is part of the entertainment industry, and football fans further support the local economy, especially food and drink businesses. Cherished sporting memories of the ‘Mem’ stadium are renewed every season, and woven into the social fabric of the city. This site has been of value to and used by the community for at least 125 years. In the nineteenth century the site was used as a public showground, as well as for sports and games. The showground was named “Buffalo Bill’s Field”, after Colonel William “Buffalo Bill” Cody, whose Wild West Show had captured Bristol’s imagination when it was performed there in 1891. Buffalo Bill’s Field continued to be a public showground, used for flying loop-the-loop air displays, various sports, etc., until the First World War. During the war, the community benefitted from the allotments created on the land. Buffalo Bill’s Field was donated for the purpose of creating a stadium for the Bristol Rugby Club, as a tribute to the 300 rugby players killed in the war, and for the expressed long term benefit of the Bristol community. In the interwar years, the Memorial Ground was used for rugby, football, archery, running and athletics. National and international matches have been held here. The sports ground became famous and much loved, the home and soul of Bristol rugby. Bristol Rugby Club shared the playing fields with the Combination Clubs and with schools clubs. Other community events included popular carnivals, and childrens’ sport and games for the 1935 Silver Jubilee. Rededicated after the Second World War, the war memorial sports ground continued to be of great value to the community, hosting events such as Bristol Constabulary inspections, the St Peter’s Hospice annual sponsored ‘Stadium Dash’, presentation evenings for local youth AFC football clubs and the rugby varsity between the city’s two universities. An annual Armistice Day service is held here every November. Since 1996, Bristol Rovers Football Club have also played at the ground. This long history of local clubs playing spectator sport at The Mem has created a distinct local atmosphere to the area. The roar of the stadium crowd can be heard across Horfield and Bishopston, as far as St Andrews Park and Lockleaze. Elderly residents whose parents contributed to the fundraising effort have spoken of how they take comfort in this ‘sound of Horfield’. Sports fans from all over the city visit the locality, many choosing to walk the length of Gloucester Road high street to enjoy the bars and eateries, to the commercial benefit of the community with its many independent shops and businesses. The Memorial Stadium is the city’s largest – and arguably most effective – war memorial. Whenever the ground is named and at matches every week, thousands partake in commemoration. The brilliant idea of a living, dynamic war memorial, marrying sporting culture with remembrance, is not an obsolete one. On the contrary, it has strong contemporary relevance, offering huge potential for its future development. 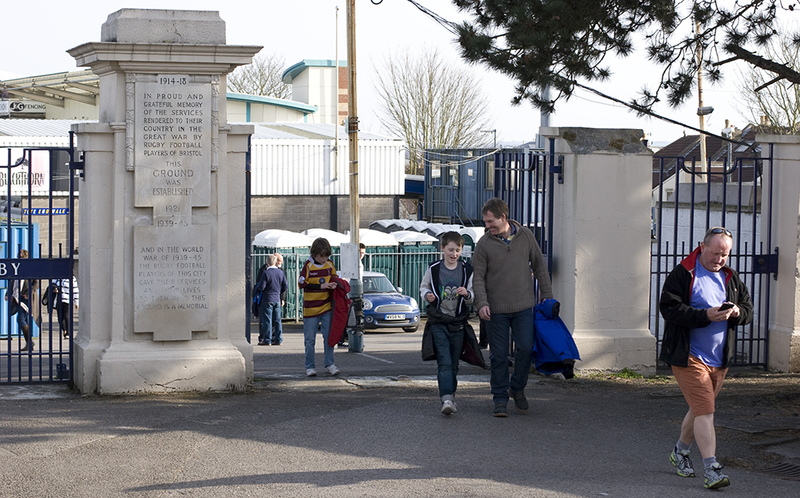 The inscription on the stadium’s listed gates bears witness to the Mem’s local historical importance and to the whole ground’s status as a memorial to the dead of both world wars. The Covenant on the land, explicitly states that it should be used for sport or recreation, for the benefit of the community, in perpetuity. It should be nurtured and protected, allowed to evolve and adapt to a changing world. Sport in built up areas in England is special but declining, due to green spaces being sold off for housing. A financially challenged football club must not be allowed to destroy the Memorial Ground, which should not suffer due to inappropriate decisions. In the event that the custodians of the Memorial Ground no longer have a sporting use for it, consultation with the local and Bristol wide community should, as a first priority, explore other sporting and recreational uses. The Memorial Ground is a world famous sport heritage asset, a gem in the heart of our community. Its founders intended it to be a place for sport and recreation forever: a place of remembrance and an inspiration for future generations. At this particular time, when we are all urged to play more sport to keep healthy, it is important to the community that at least part of this site is maintained for that purpose. It has even been proposed that The Memorial Ground could become the national rugby war memorial, commemorating the sacrifice of all British rugby players, in all conflicts. We want to make the Memorial Ground literally fit for purpose – and pass it on to future generations. This entry was posted in Uncategorized on November 9, 2015 by jamiecarstairs.